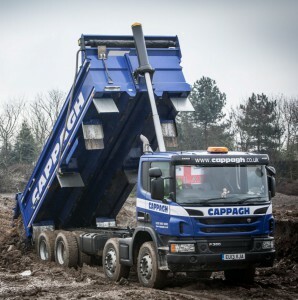 Construction industry service provider Cappagh are reinforcing their commitment to Scania with 20 new fleet additions. The haul – 19 P 360 CB8x4MHZ eight-wheelers and a double-drove R 480 CA6x4MNA Topline tractor unit – were supplied by Scania’s Heathrow branch. All vehicles join 30 other Scania trucks, the first taken by Cappagh, which have entered service over the past 18months. Conor Ferncombe, Transport Manager at Cappagh, said: “The lower cost of operation and improved fuel consumption were the two key reasons behind our initial decision to move to Scania. “Since its introduction into our fleet, the marque has been proving itself by delivering excellent fuel returns – which is the reason we are now continuing to re-fleet with Scania. The tippers are all equipped with 15cubic-metre Boweld Mightylite bodies and are stationed at Cappagh’s operating bases in Wimbledon, Heathrow and Iver. All trucks provide muckaway services and the delivery of recycled aggregates to customers inside and around the M25. In a move to help provide additional protection for cyclists, the vehicles are also equipped with Sidescan sensors, side underrun protection systems and reversing cameras. Established more than 40 years ago, family-run Cappagh provide transport and plant services, waste management, recycled aggregates and land remediation.